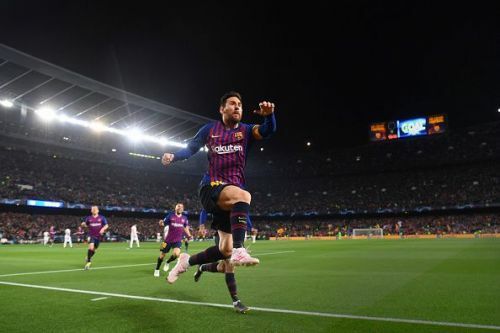 Barcelona stormed into the semi-finals of UEFA Champions League after thrashing Manchester United 3-0 on the night and 4-0 on aggregate, courtesy a stunning display from Lionel Messi. The Red Devils came into this tie with a monumental task of getting a positive result after losing 1-0 in the first leg at Old Trafford and their task was made more difficult after conceding an early goal with just 16 minutes on the clock. Messi broke the deadlock with a sensational strike from the outside of the box which beat David de Gea. He doubled the lead for Barcelona on 20 minutes, but De Gea played a part as well. Messi’s right-footed effort crept under the keeper and into the bottom corner after he failed to collect it. Coutinho settled Barcelona’s win after adding the third on the hour. Messi has now scored a staggering 24 goals in just 32 appearances against English sides in the UEFA Champions League. Here's how Twitter reacted after Messi’s breathtaking display against the Red Devils. Lionel Messi snapped his streak of 12 straight UCL quarterfinal matches without a goal. Messi scores his 1st goal of the evening. - Made 18 successful through balls this season. No other player in Europe has made more than 9.